We strongly recommend talking with a Cornerstone Mortgage Purchase Loan Specialist at the very beginning of the loan process. Before even looking for your first house, you can get pre-qualified for a loan ensuring the rest of the process is hassle-free. Cornerstone Mortgage can help you get pre-qualified and on your way to home ownership! 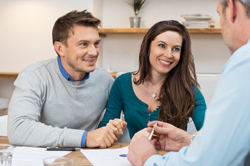 Why Should You Get Pre-Qualified with Cornerstone Mortgage?